Banana is a super delicious and highly nutritious fruit, which is very beneficial for your body and overall health. There are innumerable benefits of eating banana fruits; it’s good for your skin, eyes, bones and it helps you lose weight too. Today in this post, we are going to talk about banana benefits and why you should include ripe and raw banana in your daily diet. Ripe banana can be eaten directly, or can be used to make smoothies, fruit salads and many more refreshing recipes. Ripe banana fruits turn yellowish and soft. Raw banana is usually greenish and used for making curry, chips and other delicious recipes. Bananas are cultivated across more than 170 countries and India alone produces about 18% of the total world production of banana. The huge production of the banana fruit hints at the fact, that this fruit is loaded with several benefits and tastes. People from round the globe include both ripe and raw bananas in their daily diet. And not just the banana fruit, the trunks, leaves, banana flowers are also part of the cuisine in South Asian countries like Burma, India and Sri Lanka. This golden fruit is naturally devoid of fat, cholesterol and sodium and therefore it forms the part of the healthy breakfast. One medium size banana (about 120-127 grams) contains 110 calories, 30 grams of carbohydrate and 1 gram of protein. Bananas are rich in various kinds of vitamins and minerals and thus beneficial for your body and health. Banana fruits are enjoyed by almost everyone and it is seriously beneficial for our body and health. Daily consumption of banana fruits helps you in weight loss, to cure constipation, takes care of your heart and liver, improves concentration, plantains are used to cure diarrhea and Irritable Bowel Syndrome. The sweet taste of banana meets your sugar cravings and it also ensures the ideal levels of sugar in the blood. 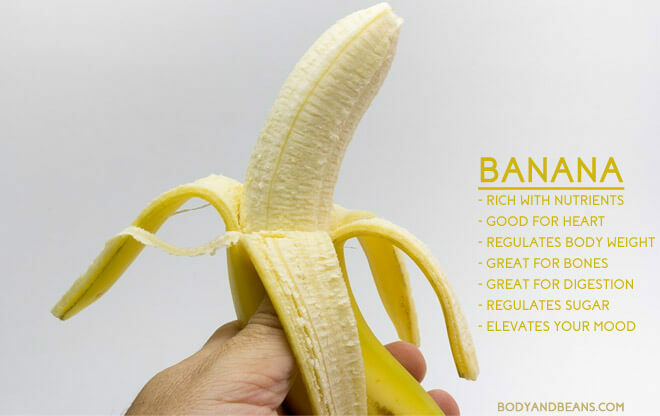 Here are the other banana benefits worth knowing about. Bananas are rich in potassium, electrolytes and also devoid of sodium. And hence it is very beneficial for heart health and blood pressure. Eating just one or two banana fruits a day can help you lower your blood pressure by over 10%. People with high blood pressure should include a banana or two in their daily fruit intake. The banana fruit helps cardiovascular systems, and ensures proper blood flow in the heart, and thus helps in curing heart blockages. If you have low pressure then you may like to eat bananas regularly as it helps in normalizing the blood pressure. According to the National Institutes of Health, bananas have Vitamin A which is extremely beneficial to your eyes; it helps in improving the night vision, and also maintaining normal vision. Vitamin A contains some vital compounds which protect the cell membranes of the eyes from damage, takes care of the cornea and also prevent disorders like macular degeneration and cataracts. Consider including a couple of banana fruits in your daily diet for healthy eyes and vision. In 2009, the Journal of Physiology and Biochemistry published an article where it is stated that bananas are rich in non-digestive carbohydrates called fructooligosaccharides. This helps the body to absorb calcium and thus strengthen the bones. Calcium is the most important mineral required for maintain the bone health, and banana is just perfect for that. If you are taking calcium tablets, then maybe you should eat a couple of banana everyday and that will take care of the bone health. Banana fruits have high level of tryptophan, which our body converts into serotonin, which works as a mood elevating brain neurotransmitter. So if you are feeling low or sluggish, have a banana and it may help you get energized. Banana can cure depression and elevate the mood super quickly. Bananas are also rich in Vitamin B6, which helps you to sleep well, and the magnesium content of banana helps in relaxing the muscles. Bananas are high in fiber which can cure constipation and keep your digestion healthy. If you are having issues in properly digesting the food, or you are suffering from constipation, eating a couple of banana may help you overcome these issues. Banana is also good for the liver and it promotes better production of bile juice. Probably, banana is the only fruit that has natural antacid and it provide relief from heartburn and acid reflux. One of the basic rule of thumb to lose weight is to consume calculated calories and burn them accordingly. 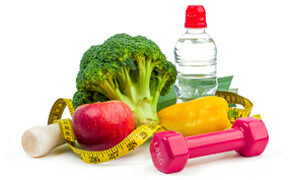 Irrespective how much of effort you put in the gym, if your diet is not right, you may have hard time, losing weight. And banana is the most delicious and nutritious fruit that kills the appetite and makes you feel fuller for long hours. Banana also increases the body’s metabolism and thus lowers the chance of the accumulation of the excess fat cells. In 2005, a study was conducted in Sweden which says that the banana is an extremely important fruit for preventing cancer. The study showed that people who ate more than 75 servings of fruits and vegetables have 40% lower risks of cancers, and the most significant fruit here is the banana. Bananas are rich in antioxidant phenolic compounds which help in preventing kidney cancers. You must have 6-7 bananas a week to lower the risk of this disease. The interior side of the banana peel is very good for your skin. The peel contains water and minerals which acts as a natural moisturizer for your skin. Rub the peel on the face, hands and neck, and wash it off with lukewarm water after 15 minutes. There are various ways by which you can consume bananas daily. Besides eating them raw in your breakfast, you can follow some other innovative ways and thus enjoy a banana rich diet every day. Make a banana smoothie with skimmed milk and a little honey. Cook the oatmeal and porridge with bananas and this will add a banana flavor to your breakfast. Enjoy banana with curd or yoghurt, mix some nuts, honey and berries to it and enjoy a healthy breakfast. Cut the bananas in small pieces and carry them in Ziplocs. In case you are craving for sweets, grab the fruit. The cool soft and sweet bananas are tasty and healthy. The fruit also keeps you hydrated. Roast the banana in the oven, and have the warm mushy bananas with yoghurt and cereals. While you are making pies and pancakes, include banana as one of the ingredients of the dishes. You can also make banana chips and eat it as snacks. Bananas are great source of energy and they will boost your energy levels to go on for the long day. If you are into exercising then banana should be the primary fruit in your diet. It will suit your appetite and also regulate the blood sugar levels in your body. Bananas have low glycemix index and thus helps in weight loss. But do not think that eating the bananas only will help you in losing weight, a minimum 30 minutes of exercise along with it can give you the best results within no time. And if you fail to exercise properly, you may put on weight by continuously eating banana fruits. Hence, take precaution and measure your banana intake. Banana is a super healthy and delicious fruit which is enjoyed across the world. The health benefits of banana include skin, digestion, constipation, blood pressure and heart. The health benefits of banana come in many levels, and so you should have one every day. The banana enriched diet will help you live a healthy and happy life. Do you eat banana? What are the health benefits of banana that you can vouch for?